Until very recently, little pertinent fossil evidence was known from the late Miocene epoch when chimpanzee and human ancestry diverged. Now there are a few contenders for the title of earliest hominin— Sahelanthropus, Orrorin, and Ardipithecus—and there will need to be more fossil discoveries for paleoanthropologists to reconstruct the root of the hominin tree. Some questions paleoanthropologists ask about the earliest hominins include: Were they woodland creatures? If so, did bipedal-ism evolve in the forest as opposed to the arid savannah where it is assumed to have evolved? How many species of early hominins were there? Did the first split from the LCA occur by sympatric or allopatric speciation? French paleoanthropologist Michel Brunet is well known for exclaiming to the media, "I knew I would find it!" after he discovered the fossil he named Sahelanthropus tchadensis. It is a single cranium (skull without mandible) dating between 7 and 6 Mya. Found in the dry Lake Chad Basin near Toros-Menalla, S. tchadensis means "Sahel-ape from Chad." The fossil was nicknamed "Toumai" meaning "hope of life" in the local language. Thanks to molecular clocks that have estimated the LCA to have lived between 8 and 4 Mya, paleoanthropologists like Brunet who are searching for the earliest hominins are more confident about exploring sediments older than 5 Mya. The associated faunal remains indicate the region was once woodland, not at all like the sandy desert it is today. Because there is no postcranial skeleton, the anatomy does not show direct evidence of bipedalism. However, it shares other characteristics with later hominins. The skull shows relatively small teeth, little prognathism, and has the foramen magnum under the skull (Figure 3.7). There is also no ape-like canine-premolar (CP3) honing-complex, which is a diastema (or gap) between the canine and premolar of the lower jaw to accommodate and sharpen the large canine of the upper jaw when the jaws are closed together. However, Sahelanthropus has ape-like teeth as well as many ape-like aspects of the skull. The cranial capacity in the attachment of the vertebrae which encase the spinal cord. The spinal cord, thus, exits the skull toward the back of the chimpanzee head (see black spot) as opposed to exiting further underneath the human head. Since the torso is located atop the pelvis in humans instead of out in front like in chimpanzees, it serves as a basin for holding the organs. This basin-shaped pelvis anchors the muscles for walking and running (like the gluteus maximus muscles) in such a way as to allow them to provide much better balance. Bipedalism requires a great deal of balance since the body is only supported by one leg for much of the motion. Ribs are very different between quadrupeds, which have more of a funnel or conical shape, and bipeds, which are straight-sided and barrel-like. Because all the body weight of bipeds is shifted to the hindlimb, there are drastic changes in the feet. The human foot compromised its use as a grasping organ, like that of chimpanzees, in order for it to be a more sturdy and efficient locomotor platform. The most obvious difference is at the big toe which is thumb-like in chimpanzees. Freed from its locomotor role, the human hand has lost adaptations for quadrupedalism, tree-swinging, and climbing in favor of those for dexterity and manipulation of tools. Illustration by Jeff Dixon. Figure 3.7 Skulls ofvarious hominin species, with a modern chimpanzee and human for comparison, show their diverse features. There are no mandibles yet for Sahelan-thropus. Illustration by Jeff Dixon. at 350 cc is small, but not necessarily any different from what one would expect in the earliest hominin, nor from an early chimpanzee or gorilla ancestor. The discoverers along with many other scientists consider Sahelanthro-pus to be an early hominin, which makes it the earliest specimen in the human lineage. But, there is criticism that because there is no skeleton to go with the skull, it is not yet known if this species was bipedal. Furthermore, the browridges are much bigger than expected. Browridges do not get large until after 2 Mya with H. erectus and earlier hominins do not have large browridges. Gorillas and chimpanzees, however, do have browridges and some critics argue that Sahelanthropus is more likely a fossil ape. The dating of Sahelanthropus is also difficult to interpret since there are no volcanic sediments available in the sea of sand that is the Sahara Desert. There is only one species of pig that correlates to a dated site, Lothogam, in Kenya, and the biostratigraphic correlation points to an age closer to 6 Mya not 6.5 or 7 Mya. If Sahelanthropus is indeed 6 Mya, then it is very similar in age to the East African hominin Orrorin tugenensis (see next section). Unfortunately few of the preserved parts overlap for direct comparison, so more fossils are needed to understand the relationship better between these earliest hominins. The earliest postcranial fossils of hominins are from 6 Mya. They include a couple of fragments of leg bones and a few teeth of Orrorin tuge-nensis from the Tugen Hills of the Lake Baringo region of central Kenya. Brigitte Senut and Martin Pickford made the discovery just around the turn of the last century, which inspired its nickname "Millennium Man." Orrorin is humanlike in its thick tooth enamel, tooth size, and morphology. It has also been claimed to be bipedal because of morphology of the femur. The neck of the femur is long like in humans. 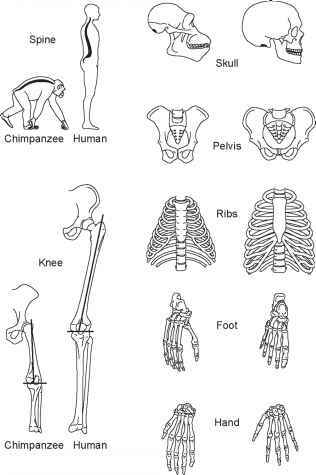 Plus, x-ray images indicate the bony infrastructure is more like humans than apes. That is, the bone was built up to withstand the types of forces generated by walking upright on two legs. The bipedal status of Orrorin is still debated, however, because the scrappy fossils do not yet offer clear-cut, convincing evidence. Originally placed in Australopithecus, Ardipithecus is a genus represented by an accumulating number of specimens from sites like Aramis in the Middle Awash region of Ethiopia. Ardipithecus ramidus means "root ape" in both Latin and in the native language of the region. There is little morphological change from 5.8 to 4.4 Mya, so those who work on these fossils (e.g., Tim White, Gen Suwa, Berhane Asfaw, Johannes Haile-Selassie) kept variation to the subspecies level with Ardipithecus ramidus ramidus (4.4 Mya) and Ardipithecus ramidus kadabba (5.8-5.2 Mya). Little of the skull and postcranial morphology of Ardipithecus is preserved. There is a fragmentary skeleton waiting to be published, but for now there are mostly just bits of skull, teeth, jaws, and a few postcranial remains on record. The reduced size of the upper and lower canines relative to premolars and molars is more human- than ape-like. 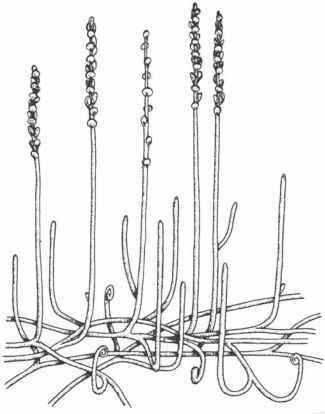 However, Ardipithecushas primitively thin enamel and primitive, albeit diminished, morphology of the CP3 honing complex. Was Ardipithecus bipedal? The foramen magnum is located underneath the skull in A. r. ramidus, suggesting it was. Also there is a single toe bone (phalanx) of A. r. kadabba that is shaped like a human's as opposed to a chimpanzee's. Evidence from Ardipithecus sites—like seeds, monkeys, and browsing antelopes—indicate the habitats were mostly closed canopy woodlands, not savannahs.